This post was first published at PROSPECT’s Blog. While there’s a cynical part of me that thinks Niall Ferguson wouldn’t be so quick to blithely dismiss Iranian air defense networks if he was expected to risk his life in the wars he champions, I agree with Saideman’s view that it’s important for civilian policy elites to play the dominant role in setting foreign policy. But Munson’s right to remark “that people signing others up to ‘protect’ with glib assumptions of easy and limited interventions and quick success deserve the rhetorical jab.” Best-case-assumptions are a lot easier to make when it’s not your life at risk if you’re wrong. Most proposals for intervention in Syria lack any kind of coherent step-by-step progression from engagement to exit, replacing the “how” of military planning with magical thinking. 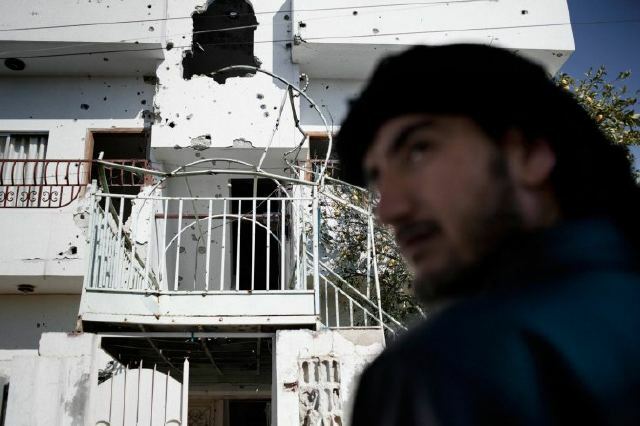 Unlike Libyan rebels the Free Syrian Army is at best a fractious and ineffective fighting force, holds no territory and lacks heavy weapons; a NATO air campaign based around providing air support to rebel ground forces would not be applicable in Syria. At its very best a NATO or Arab League mission to establish and protect safe zones on the Syrian border would be an indefinite combat commitment, and it’s worth remembering that the Operations Provide Comfort/Northern and Southern Watch — which established civilian ‘safe zones’ in Iraq — killed US servicemen and only ultimately ended in regime change. These concerns didn’t sway the student; in his view morality and a “belief in democracy” make intervention worthwhile, despite great risks. This is troubling. Morality should have no bearing on the decision to go to war. The United States should enter foreign conflicts only if the likely payoffs from victory outweigh the expected costs. Commenters who aren’t willing to take the time to make a realistic assessment of the prospects of military success — whether undergraduates or highly-regarded academics — cannot make a rational decision whether to go to war. Wars aren’t won by “belief in democracy” or even morality — a successful intervention in Syria rests on NATO’s ability to destroy Syrian military assets and coerce the Assad regime into leaving power. There’s no middle ground: like in Libya, entering a Syrian civil war means tying NATO credibility to the overthrow of the Assad regime. Unfortunately, there’s no line between the limited humanitarian missions fans of R2P advocate and regime change. After all, the Libyan war began strictly as a no fly zone without the goal of actually deposing Qaddafi — a fiction that lasted about five minutes. Either the violence in Syria warrants a Western intervention that would escalate violence in the short-term and perhaps lead to the downfall of the Assad regime or it doesn’t. The debate over a “Responsibility to Protect” is irrelevant to whether NATO even possess a capability to protect Syrian civilians. Given that US ground forces were unable to protect civilians in Iraq — a sectarian, urban conflict with more similarities to today’s Syria than the recent Libyan war — I’d argue that it does not. Debating whether we should enter Syria without carefully considering how NATO would tactically and strategically fight, and ultimately exit, the conflict is potentially disastrous. Often the military’s group think and pressure to fall in line with optimistic narratives passed down from civilian leaders hampers this assessment at the military level: as Saideman notes, “we already have enough presidential candidates saying that they will do whatever the generals recommend, as if the generals speak with one voice and think with one mind.” But what’s worrying to me is that not only do most of my fellow IR-studying UCSD undergrads ignore military realities when arguing for foreign interventions, but seem to actively disdain them. Grand theories and concern for the suffering are important. But advocating for foreign war without making an effort to learn anything about the capabilities of the US military — specific weapons systems, military history, operational limitations — is recklessly irresponsible. Saideman’s right to note that military experience isn’t necessary to be informed about security issues. But advocates for humanitarian intervention unwilling to consider the hows of military action are dangerously close to the willful ignorance and blind optimism of the Bush administration. Title image by yfrog user 3ayeef, via @acarvin. 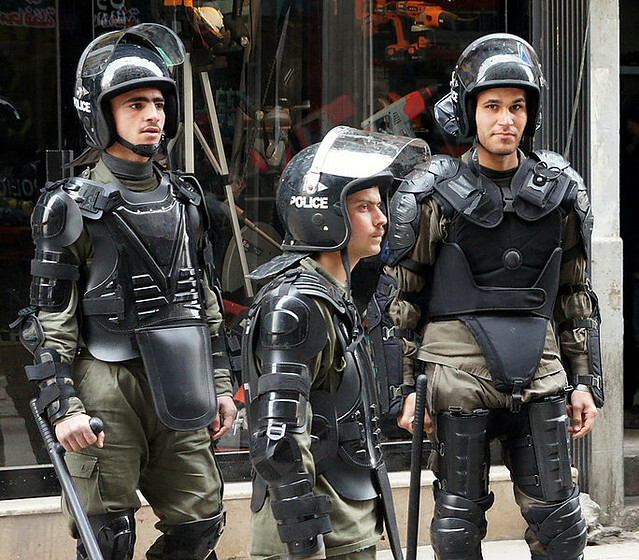 Syrian riot police, Damascus. Voice of America photo by Elizabeth Arrott. ← SINK OR SWIM — WILL THE EURO ZONE CRUMBLE?